Development of the face and jaw is greatly dependent on the bone structure and muscle movements. Also habits can cause changes in the child’s growth pattern. This can then lead to other issues in the shaping of the growing child. A common example of how multiple issues of development that needs to be monitored is the development of the upper jaw. The upper jaw consists of two bones, the maxilla, joined in the midline. This then forms the palate. Sometimes this palate is quite high up and compared to where the teeth sit. This is called a highly vaulted palate. On the other side of the palate is the floor of the nose. If the palate is high and therefore the space in the mouth is greater, unfortunately the space in the nose is reduced potentially causing nasal breathing issues. Also, not only is the palate high, but the width of the palate is narrower. This then causes the teeth to not line up correctly with the lower teeth. This then cause what is called a cross bite. 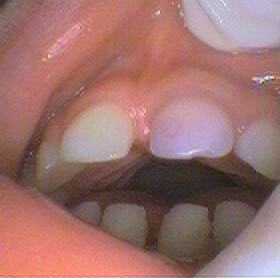 This is where the upper teeth sit inside the arch of the lower teeth rather than outside of the lower teeth arch. This can lead to teeth crowding. If the bite is correctly aligned, then there may be problems with the lining up the jaw bones correctly. This may lead to the chin not lining up with the midline of the face. These habits include thumb sucking & dummy sucking. These habits cause the front of teeth to be pushed forward together with the palate behind the teeth. The teeth can be pushed so far forward that an open bite occurs. In severe situations the teeth interfere with the lips sealing in the act of swallowing. The position of the front teeth now pushed forward may affect speech leading to a lisp, or tongue thrusting. This habit also causes the front teeth to have spaces between them. The front teeth in a forward position will make the front lip look prominent. This example is just from two bones in the face! The dentist needs to check regularly from a very young age, even from 12 months old. Early intervention and education are important. Next in the series we will look at other aspects of development and even other bones!